It’s summer and whether you work at home or in an office, you may refresh your space for the season. Sprucing up the workspace for summer will inspire you to work better, will remind you of your amazing holiday and you’ll have a lot of fun. 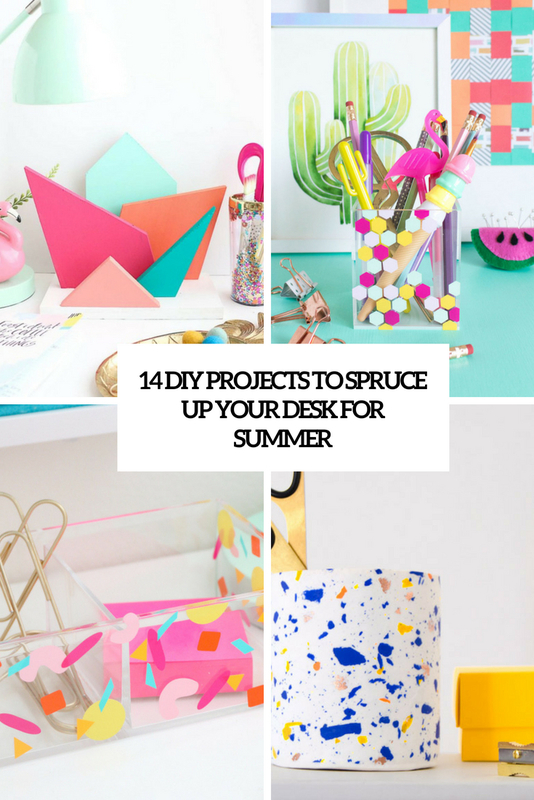 I’ve gathered some cool and easy crafts that any of you can realize to make your workspace brighter and infuse it with color, choose what you like and go crafting! 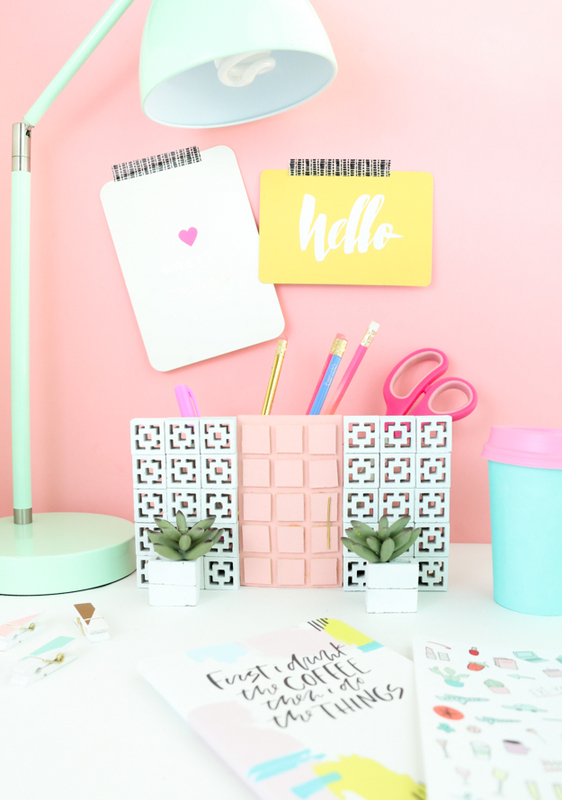 The first craft for today is a cool desk organizer of breezy blocks and with a pink part – it’s inspired by Palm Springs. The whole craft won’t take much time and can be used for covering usual pencil holders and other stuff, it looks very summer-like thanks to that mint-pink color combo. Get inspired and make one! 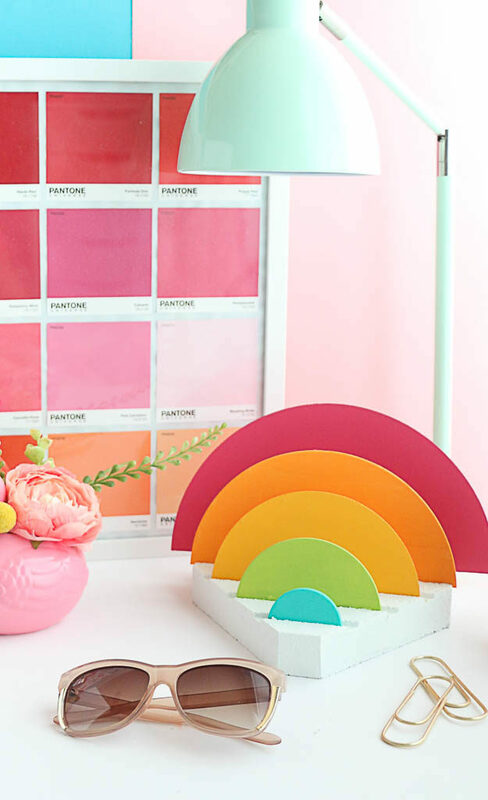 Rainbow is all you need to spruce up your desk for summer and just for every day! This rainbow desk organizer is made up of wooden rounds and some bright paints. The piece is very stable and can be used for storing documents, papers and other stuff with comfort and much color. Don’t forget to buy a cork trivet to attach your colorful rounds to it. Get inspired! 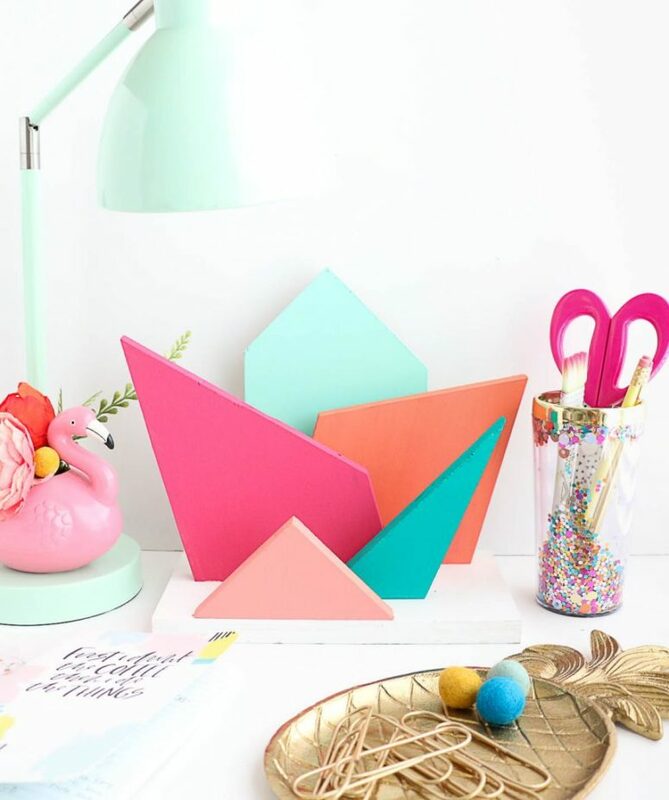 The colorful and bright desk organizer is right what you need for a summer workspace. Make such a trendy geometric organizer of wood pieces painted in bright colors. The asymmetrical geometric design is an edgy idea, read how to make such a colorful item for your working space and craft one or make it as a gift for someone you love. There’s nothing more party-like than confetti! 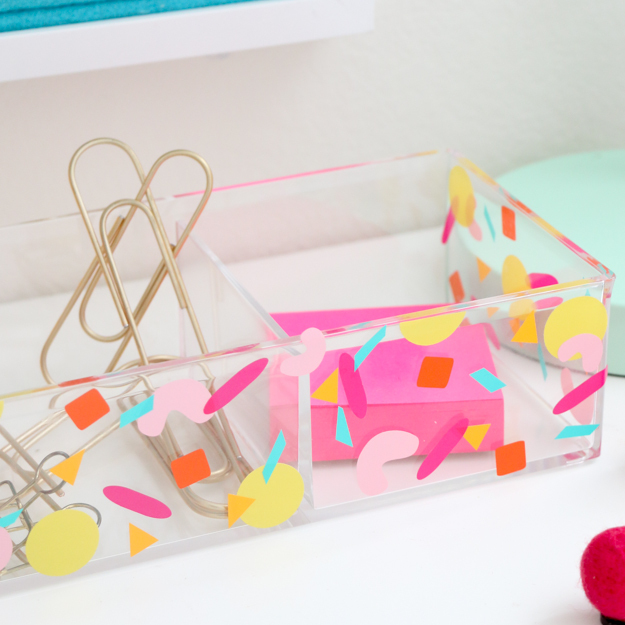 Spruce up your working space with a modern acrylic organizer decorated with colorful acrylic confetti stickers. Stick colorful vinyl to the surface for a little confetti action – such an organizer is great not only for desk stuff, it can be also used for some food and dessert serving. 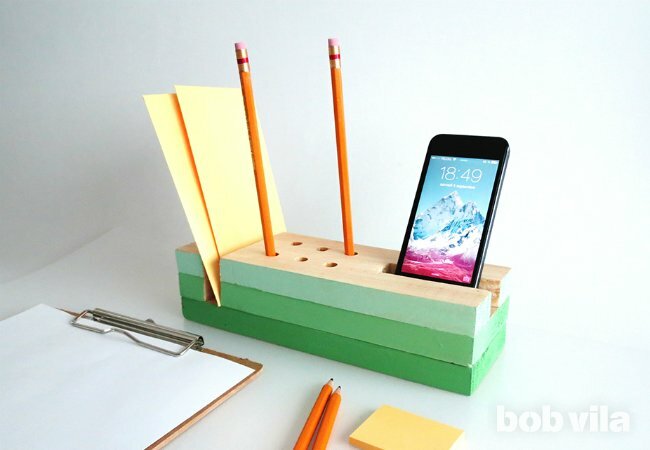 Keep pen, paper, and your phone right where you can see them using a colorful wooden desk organizer. The piece is painted ombre green, which brings freshness and cuteness to the workspace, though you may vary the colors and make it much brighter. 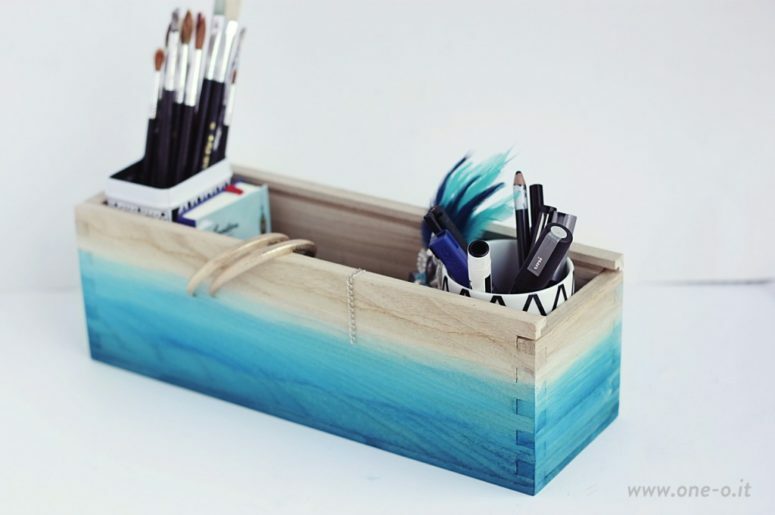 This bright and fun desk organizer reminds of the beaches and holidays thanks to its ombre blue look. The organizer is simply a wooden box painted in the shades of blue to create an ombre effect, it looks bold and fun and very summer-like. So cute and so easy to make! Terrazzo is a popular material for decor, it’s durable, not expensive and very bright and colorful but making a pencil holder of it might be difficult. 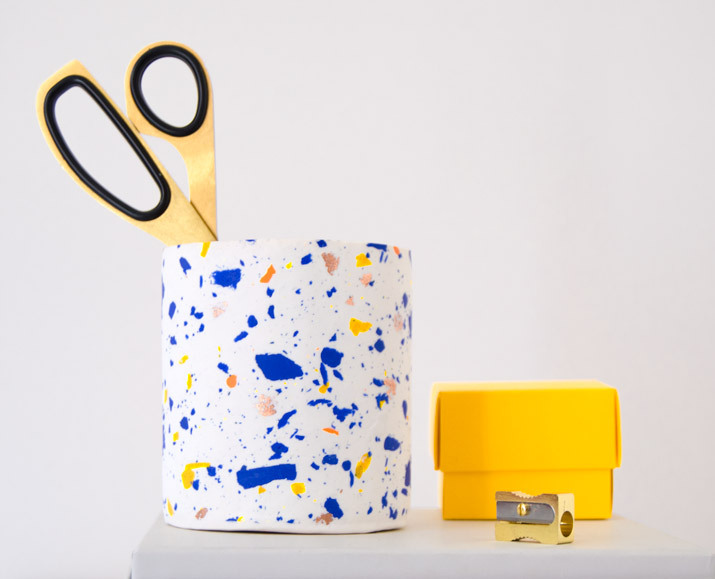 Make a pencil holder that imitates terrazzo – with bright paints. Such a craft won’t take much time and is a bold and fun idea, just add some color to a white jar and enjoy! Add a little of trendy geometry to your workspace with this bright and modern acrylic pencil holder decorated with colorful hexagons. 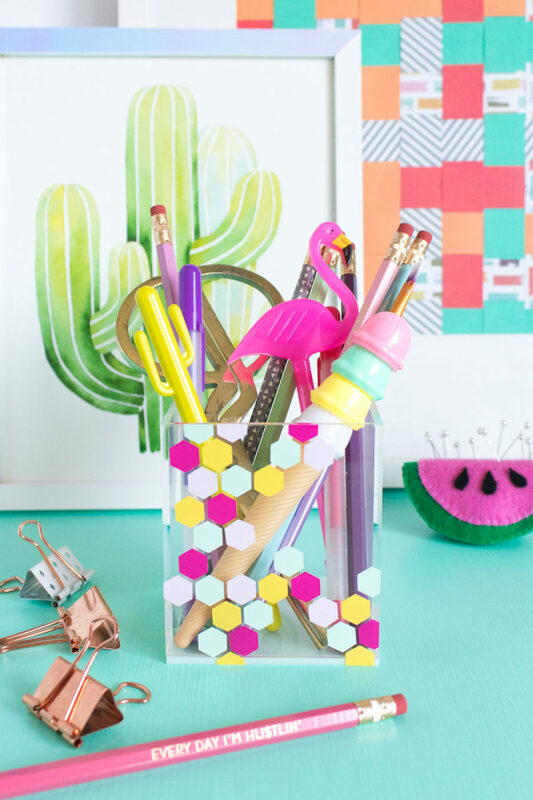 The craft is very simple: just take a clear acrylic container and decorate it with colorful vinyl hexagon stickers. 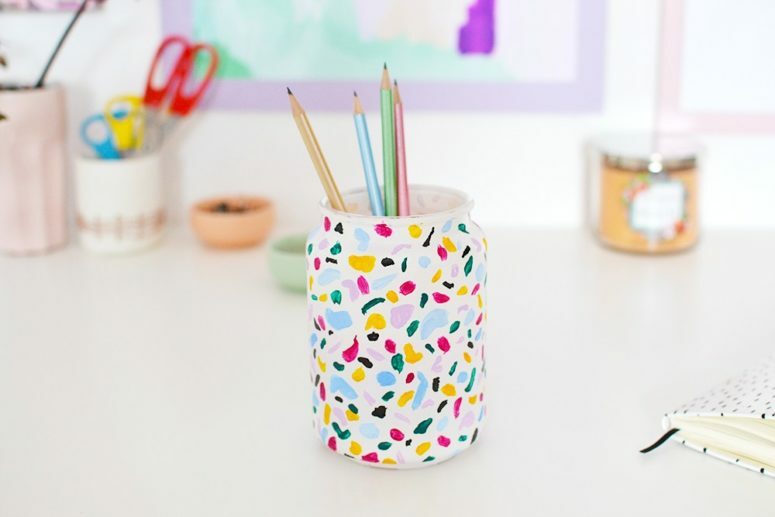 Get more details in the source and make a bright and trendy pencil holder! 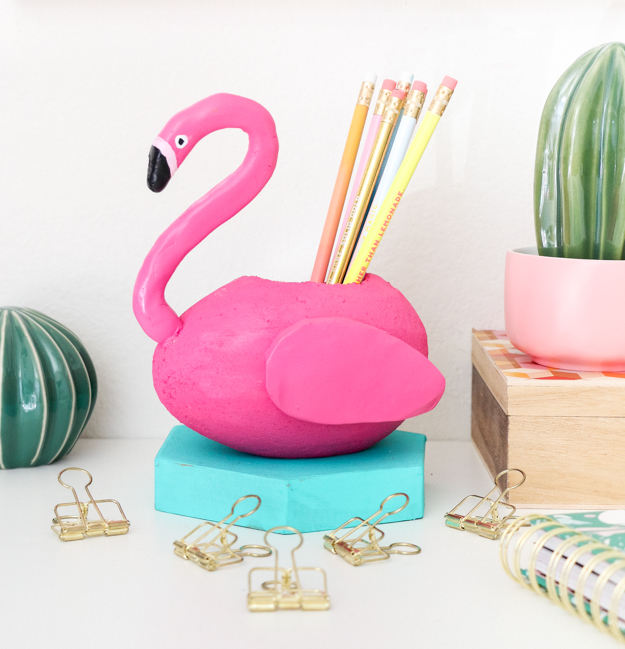 This pencil holder will bring a fun touch to your working space – it’s a flamingo pencil holder! The piece is made of a foam egg and some polymer clay, which was used to make the flamingo head and wings. Make a bright pink flamingo pencil holder for your desk or make it as a gift for any girl – so whimsy and so fun! 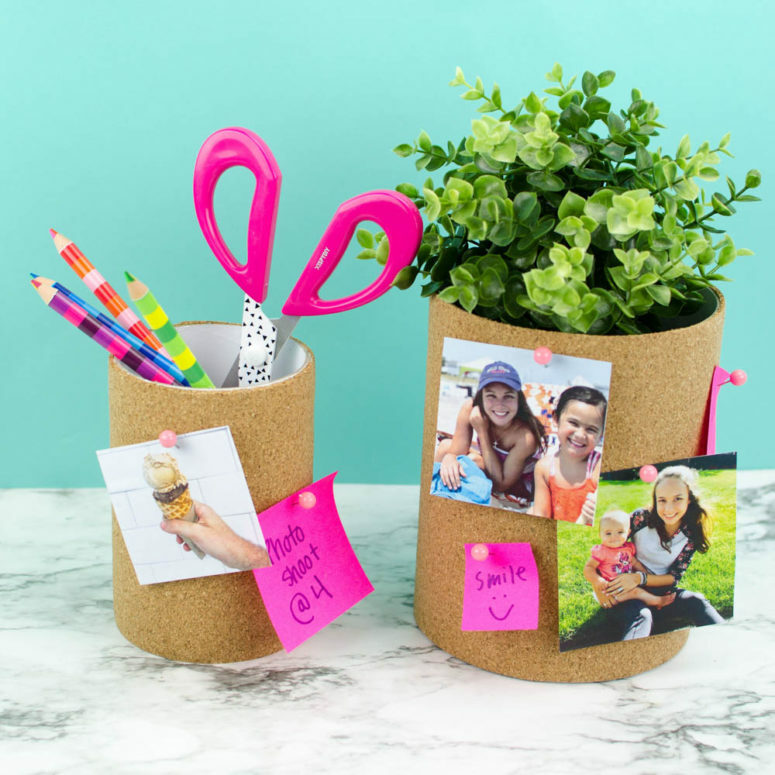 Cork pencil holders aren’t basically bold and colorful but you may make them bright yourself attaching some stickers, photos and fun magnets. This tutorial will tell you how to make a usual cork pencil holder and then feel free to spruce it up with various colorful touches. A usual box can be spruced up with colorful hexagons using a stencil. 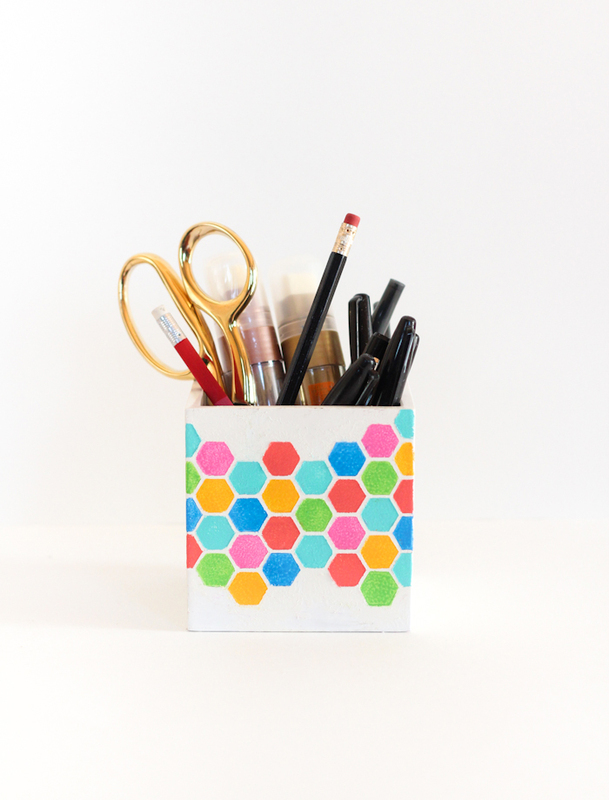 Take any box that you like and make a colorful geometric pencil holder using a stencil and some bright paints. Such a piece is suitable for every desk, both a masculine and a feminine one, and can become a nice gift. Here’s one more super bright terrazzo-inspired pencil holder made of FIMO clay. The idea is about taking a usual tin can and sprucing it up with colorful FIMO clay – the brighter clay you choose, the brighter the final look will be. Get inspired! 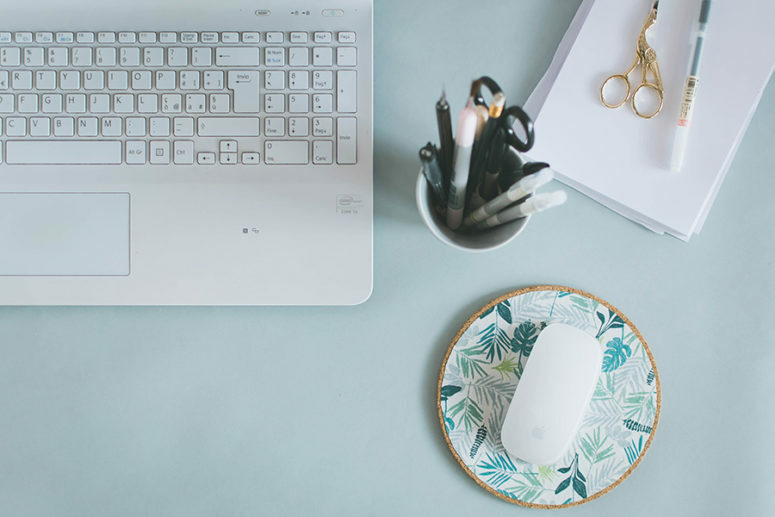 Tropical leaves bring an instant summer feel to the space, and you can bring it to the workspace making a tropical leaf mouse pad. The piece is made of cork and covered with tropical leaf paper, it’s small and cute and looks very elegant – suitable for anyone! 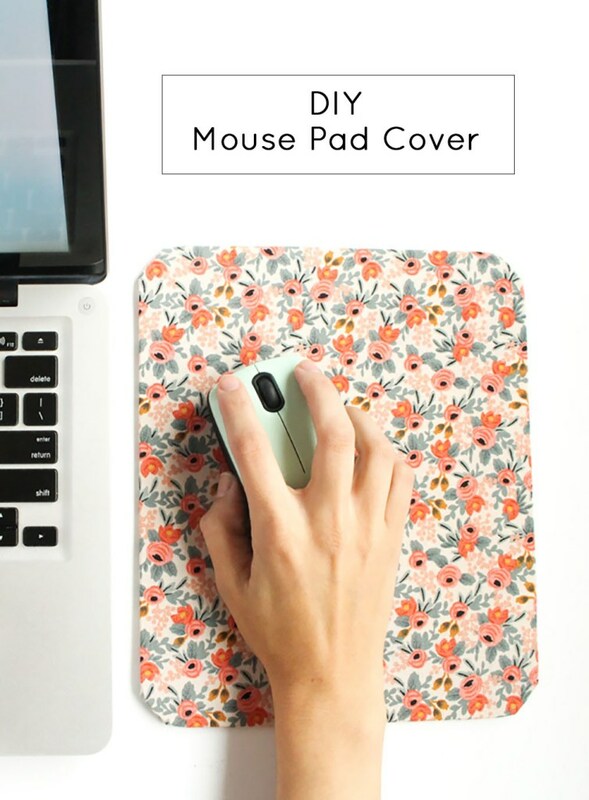 Spruce up a usual mouse pad with retro printed floral fabric to give it a more summer-like look! The idea is about attaching the fabric to the pad using Mod Podge, it’s very simple and fun and retro floral prints are great for any space, they are timeless.